^ 谢志强. 不可不知的地理常识. 青苹果数据中心. 24 December 2013: 527–. GGKEY:PUYT2B97F8P. 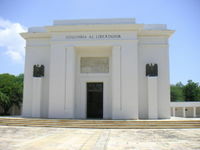 ^ Museo Simon Bolivar[失效連結], Cenarruza-Puebla de Bolívar, Spain. ^ Arismendi Posada 1983, p. 19. 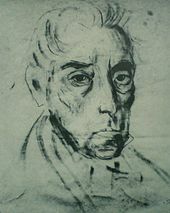 ^ Bolívar, Simón. Hope of the universe print. Paris: UNESCO. 1983. 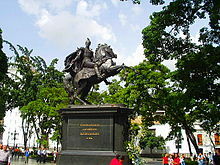 ^ Simón Bolívar entry on Find a Grave.com. ^ Forero, Juan. Chávez, Assailed on Many Fronts, Is Riveted by 19th-Century Idol. The Washington Post. 23 February 2008 [17 July 2010]. ^ Bolivar and Chavez a Worthy Comparison. Council on Hemispheric Affairs. 11 August 2011 [2012-04-09]. （原始内容存档于2012年3月30日）. 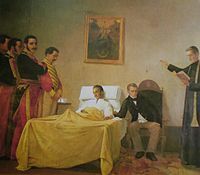 ^ Doctors Reconsider Health and Death of 'El Libertador,' General Who Freed South America. Science Daily. 29 April 2010 [17 July 2010]. ^ Allen, Nick. Simon Bolivar died of arsenic poisoning. The Telegraph. 7 May 2010 [17 July 2010]. ^ Girish Gupta. 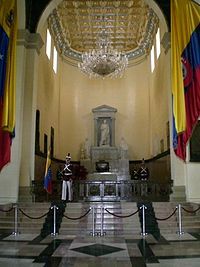 Venezuela unable to determine cause of Bolivar's death. CSMonitor.com. 2011-07-26 [2013-06-29].